These earrings are made from a flier advertising a Joan Jett and the Blackhearts show at the Marin County Fair. 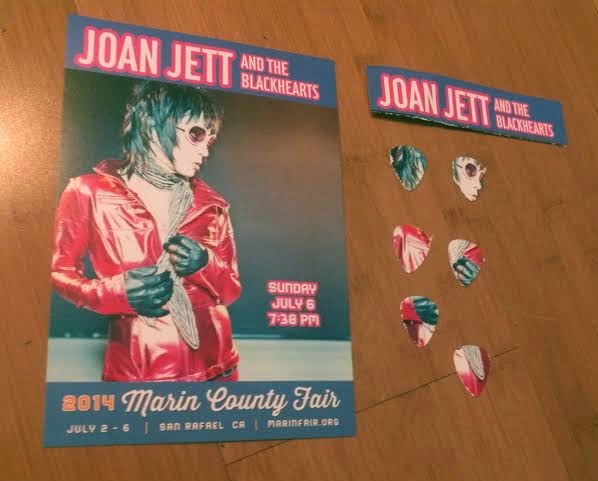 July 6th 2014 was a really special day, and not just because I got to see Joan Jett live. I also got to meet her! Which was a life long goal and one of my happiest moments ever. As the concert high mellowed down, I got to work punching out guitar pick shapes from the flier with my Pick Punch. I put a lot of love and detail into these and they turned out pretty awesome! I used Mod Podge Glitter and embedded a red guitar pendant in the back of the pick. 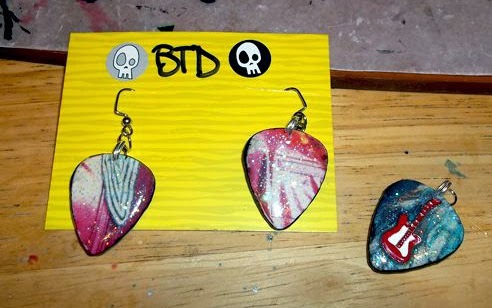 The Joan Jett earrings and pendant are just too sentimental for me to put up for sale. However, I can make more just like these! 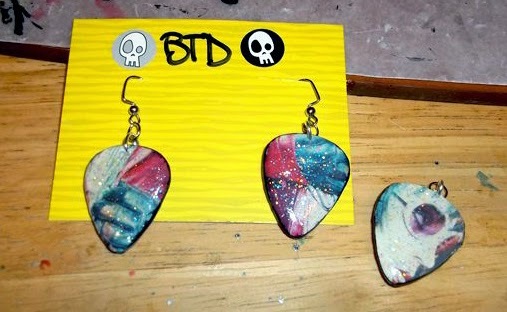 If you have some printed material (or an album sleeve for example) with your favorite rock star on it you can send it to me to get made into guitar pick jewelry. Contact me to get the ball rolling and I'll help you along the process. Being a lover of music and creating jewelry, I will take care of the printed material throughout the process. You just have to be comfortable with your material getting methodically cut apart and into guitar pick shapes!